This blog will have no editing, will not have anything erased or corrected, it will be as it is on Thursday nights sitting at the table, pen in hand flying over the spiral, fresh and bold, and unfettered by the mind’s editor. It is writing down the bones. It is based on one true thought. Back in 1998 I don’t even think I had a cell phone, and am pretty sure she didn’t. So, we’d be sitting at the table, one of us waiting for the other, and it was one of the most amazing times of my life, and it gave birth to an amazing thing aside from this beautiful friendship. We met at a big table in the basement of the local library on a cold January morning. It was my first foray into a writer’s group, it felt like AA, and I was petrified. I’d been writing for 8 years, but had never been with writers. It felt like a secret, and if you’re a writer, you’ll understand. Going to my first writer’s group was like having to acknowledge this part of my life that was solitary in its essence, but obviously could not remain. My friend is dark haired, and her voice is as beautiful as the ocean on a sandy beach. Soft, husky, her laugh is gold. Her poetry is so honest that I could not look away from her when she read it, I had to watch, but I felt like I was intruding on the most sacred part of herself. Her pain, her beauty, her reality. One day before we knew each other, she said to me, “I know why you are here. You are here for me.” I was not one to be so bold as this to say something like this, to think she would know this of someone unworthy of such a thing, truly, but I believed her. My friend’s writing is brave and powerful and so much of who she is, that when she reads it aloud, I feel that she’s entrusted me with her heart and she places it lovingly in my cupped hands–glistening, and beating, life blood rushing through it, and I hold it gently and the beating matches my own heart, until she takes it back. It’s truly like nothing I’d ever known. We just wanted to write, my friend and I, so we devised a plan to meet on Thursday nights and “write down the bones” using the principles of Natalie Goldberg’s book “Writing Down the Bones.” We started with one true sentence or thought, (harking Hemingway) and we’d time our writing and then read it. No editing, no passes, just bravely read. Oh, the words that flowed, and the very way we felt honored and protected to put it out there for another. It opened my heart and mind and made me brave. There are no words to express it, even though, I am a writer and I love the English language almost like I love my husband or children or myself. And yet, in these early months, in the dog days of summer of 1998, it was a time that I cannot express in words the value it is to me. Kindred spirits doesn’t cut it. 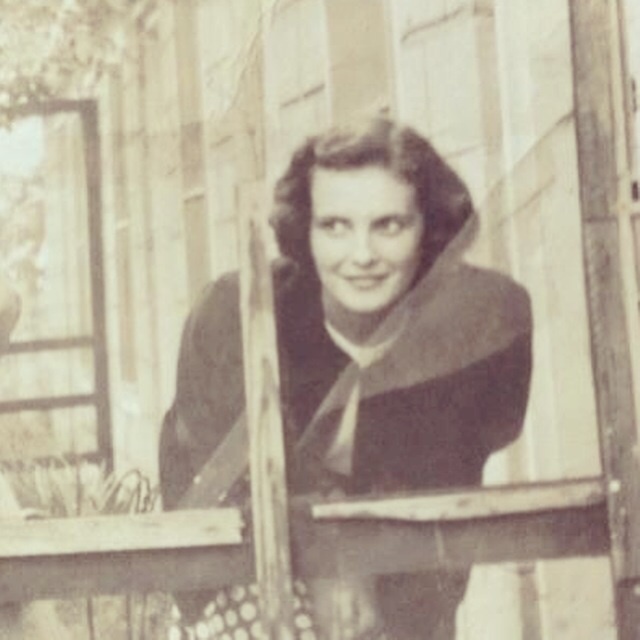 After a time, people began to wonder about us, were drawn to the women who sat every week writing and sharing, and would approach us and ask if they could join us. And soon we were pushing tables together and scraping chairs along the floor to accommodate the group, and coffee was offered, and thoughts and ideas were expressed, we called it Writer’s Anonymous (WA). We’ve seen more than 200 writers pull up a seat at the table through the years since two women sat together with the sun setting behind us writing down the bones. They’d pass through and leave themselves with us, and then move along on their own journeys. My friend and I, we’d find each other in the midst of this big amazing thing, the hum of writing, the throwing down of glasses, the shyness and the boldness of it all, and remember the birthing of it. Our gazes would meet above the fray and we’d know from the bottom of our hearts that it’s true–my friend, this is why you are here. Our daughter, Bethani, recently landed an amazing dream job, and an amazing apartment, and an amazing guy, and we have an amazing empty nest. Through the past few years, or maybe forever, I’ve always had an intense dislike for the deep pink color of her room. 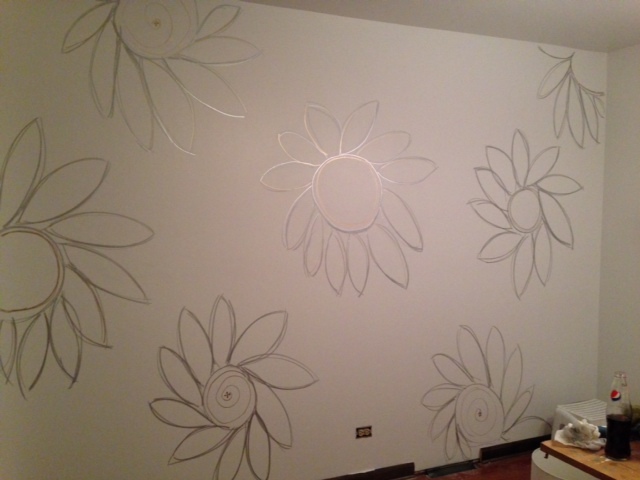 So, very quickly, I went to spackling and taping her room. It had been my plan for a long time that I would paint it white, and I would kid Bethani and say, “Can’t wait till that pink room is white…” And I think that made her a little sad, but it really was my way of helping her fly the nest. 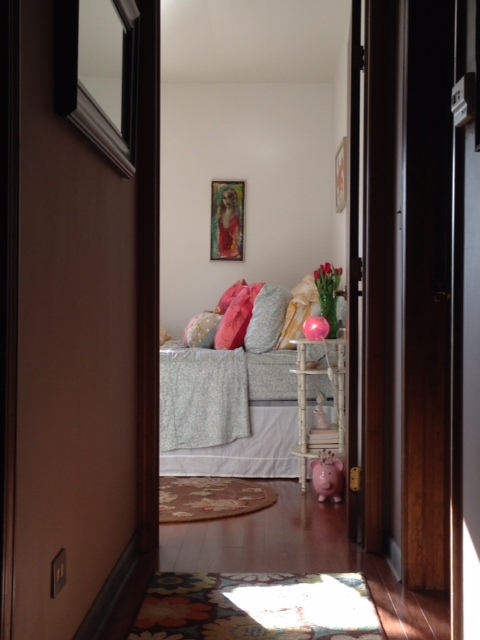 She had come home from five years of college to sit three years staring at those pink walls. She had an amazing job working for a vet, and she loved it and the people she worked with, but it was not enough salary to make it on her own. So, the child remained home, and the pink remained pink. 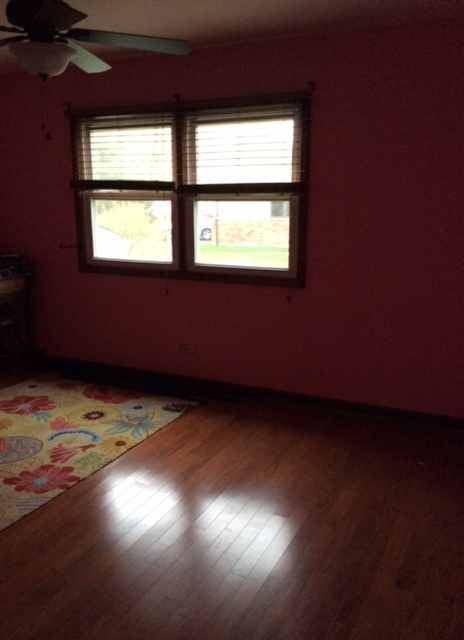 So, I’m spackling, and taping the woodwork, and then it all came to me–as much as I wanted my children to fly, a little part of my heart was hurting, so I did what any momma would do, I sat on the floor and had a pity party and cried. Cue hubby. Since, I was of no use whatsoever, he took to painting first with Kiln Primer, and then with Valspar Pure White in eggshell so that it would reflect the eastern light. Apartment Therapy had a great article on how to choose the right white, and I spent a lot of time watching the light flooding in from the outdoors on the eastern side of the house each part of the day. Everyone has an opinion about white, and it IS a color, because some are golden, some have a bluish tint, some pink (God forbid) and each react differently to the light from outdoors and inside. So, I chose a white that had a bit of blue in it, and it’s perfect. Well, I’ll let you decide. My buddy, Sandy, who has an amazing blog Found This Painted That has been egging me on encouraging me to use paint in a dramatic way. “Paint that cabinet! !” Like this one, but I could not touch paint to that wood, and it caused me grief, because, there is an artist in me, and I am truly encouraged by Sandy’s blog, and her courage to paint, not just furniture, but amazing decorating ideas. Bossy Bold, my friend, she’s bold. I love the look of wallpaper, but I can’t measure a single thing or do anything straight except to hang pictures which 9 out of 10 times will be perfectly straight. So, wall paper is out. Time to paint. I loved it. Hubby who was totally against not at all keen on my doing this after slaving away painting the darn walls, was shocked thrilled with the results. 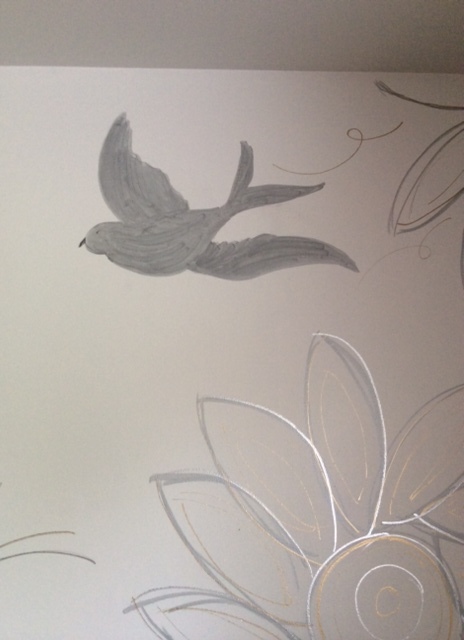 But, something was missing, and I knew all along that I wanted to paint a bird into my wall. I wanted the “wallpaper” to reflect the time, and the emotions I felt about letting my children go. 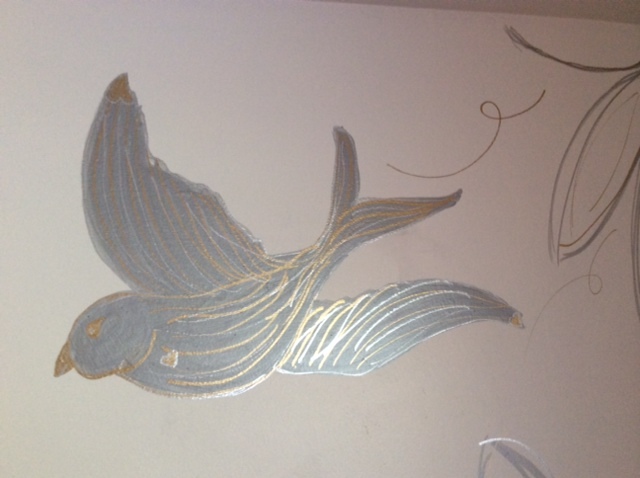 I painted in the bird in flight, I used a few different pictures to help me find my own bird, and I watched how they soared in my yard, and here it is before embellishing. And here it is after. I painted tiny gold hearts on its wings to show that it flew with love on its wings from its momma and dad, with hope and joy and a lifetime of love. I’m an impossibly sappy momma. What can I say? Don’t even mention big old softie dad…shhh. And then, I shopped my house. 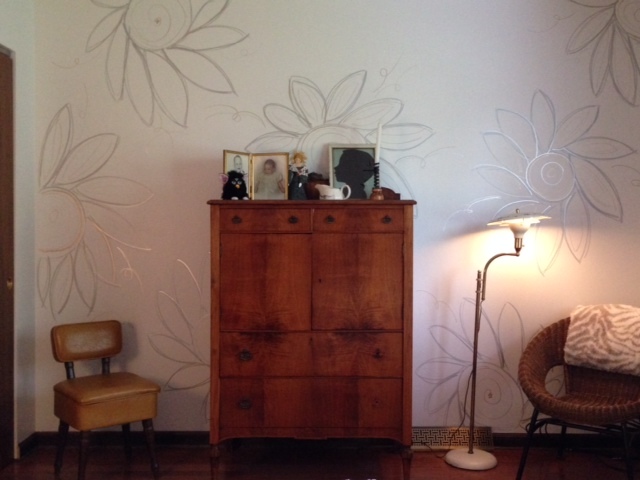 I moved the big, old dresser from our bedroom (thereby freeing up a massive wall for another project?) and layered all the linens Bethani didn’t like onto the bed. I found this amazing carpet that will go with anything for 99 bucks at Home Goods (love that place.) And all in all, we spent just $212.78 for everything. I added lots of art from our long life together, and our flea finds, including the exquisite Samuel Bookatz painting on burlap of a girl that twinsie found for $40 bucks at the flea. 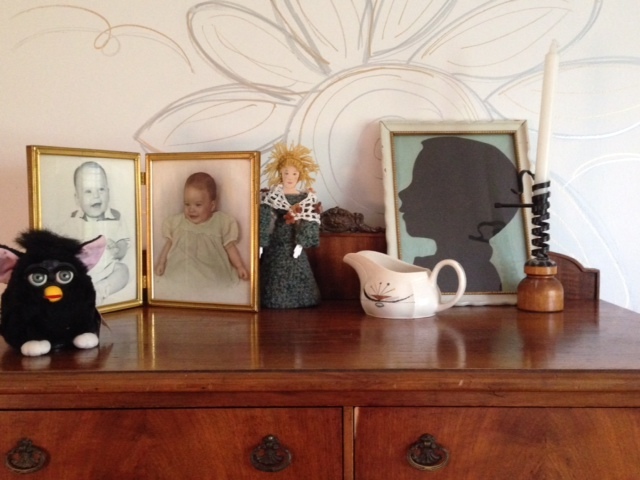 Not to mention the old lamp, orange child’s rocker, and the gold sewing chair, and 70s lamp. Tomorrow, we are showering twinsie’s daughter, Jay, as she prepares to give birth to a baby for Grandma and Nonnie in August. And my niece and her little girls will be coming to stay with her Auntie B and Uncle Rick. She has made a padded headboard from a silvery gray material with diamond buttons that will be the final touch to the room…for now. Letting go. Beginning again. New baby coming. Maybe a wedding next year? New chapters in life that bring a multitude of emotions. You told me how good it would be to see us, and you would show us to everyone. When Mother’s Day came, we went to church and then shopping for new sneakers for me, since my old pair had seen some miles, and then I ran to church for a meeting and wasn’t able to get away until 8–that’s 9 your time, and so instead of calling you and waking you, I decided to wait and call you the next day. The silence came then, mom. The silence you always waited for because I chatted all the time, but it took your death to bring it. I could not form words anymore, mom. I couldn’t think, Brinkley led me back home that day, or maybe I’d still be out there wandering six years later. You managed to get your way, per usual, and that had to bring a smile to your face. I did come to see you, Twinsie made me. I didn’t want to come, I didn’t want to see you with no breath in you, no sparkle in your eyes, no smile. But, you lay there like Sleeping Beauty. Your pale skin was taut, your lips just the right shade of lipstick. Your hair had been done on Friday, and everything about you was beautiful. The sunlight peeked through slate gray clouds and shone on you like a beam from heaven. We could hear the angels sing, mom. Crazy, right? They say peace is something we will never truly know, but you did. You had it there on that gurney with the sunbeam from heaven. The peace that passes all understanding. The scrapbooks, or better, the bunch of papers with a sentence here, and a sentence there, are still in the suitcase we brought back with us. Silent as our voices were, they remain untouched. I just wanted you to know that I miss you. I wish I’d known that you needed help with your memories and getting them down on paper. I mean gosh, you wrote whole histories about presidents and others. I didn’t know that you were robbed of the memories that meant the most. On this day, in a few hours, the anniversary of your death will come upon me, and my sisters, and my brothers. We will all feel it differently or maybe not feel it at all. But, I will feel it, mom. I will remember, and I will cry, and the silence will come like the night quiets the birds, and it will be peace that I will feel, knowing you are safe, whole, healthy and strong. Not as Sleeping Beauty, but as an angel.